I was so excited to experience a dinner prepared by Executive Chef Sydney Hunter III at Café Pinot. The seasoned chef began his career at L’Orangerie in 2002. 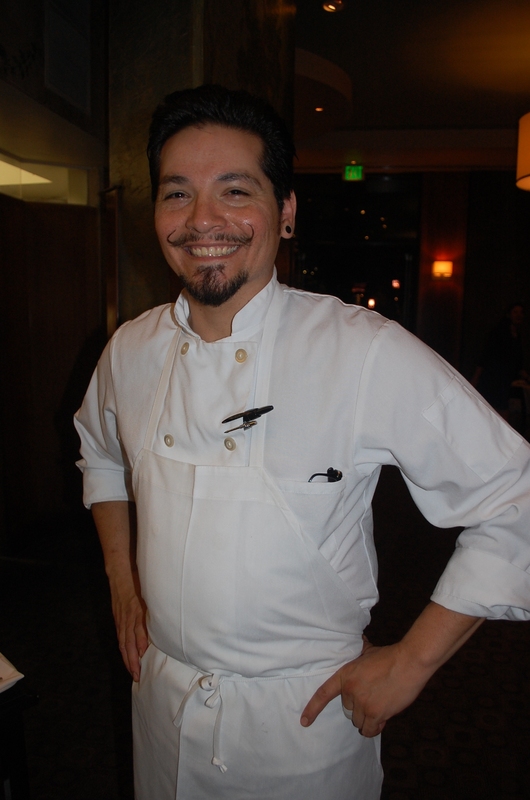 Some may remember him at Bastide on Melrose. Chef Joachim Splichal, founder of the Patina Restaurant Group, recently gave Hunter the coveted white Executive Chef jacket at Café Pinot. We were seated on the front patio where a modern fountain provided bubbling brook sounds as the cars on Fifth Street bustled by. The main patio, which has been voted as one of the loveliest dining patios in Los Angeles, was occupied with a large bar mitzvah party. It’s reserved often for private parties. Chef Hunter wowed me immediately when a bowl of English pea soup arrived with a generous circle of almond flan on top. The luscious, warm, green liquid was not burdened with cream, but surrounded with dainty pea shoots and a sprinkling of green chive oiland almond flan. Very clever and delicious. Hunter’s Japanese Hokkaido scallops rested on cauliflower purée with a sprinkling of toasted sliced almonds. The tender scallops were adorned with a thin shaving of cauliflower topped with a melding of radish, caviar and daikon sprouts. Ruby-red currants in port wine dazzle this dish. For entrées, the leek and button mushroom ragout serves as a tender base for the perfectly cooked turbot fish. It’s topped with thinly sliced cauliflower, toasted almonds and an amaretto cherry jus. Hunter sprinkles the dish with cherry spice on top. Another favorite was the beef tenderloin with al dente asparagus and a decadent potato and celery root gratin with emmental cheese. It tasted similar to a delicate potato and Swiss cheese gratin, yet with a zing of celery root. The succulent maitake mushrooms were a nice touch with the red wine Bordelaise sauce. Click on this link to read the rest of my review http://parklabreanewsbeverlypress.com/news/2012/06/cafe-pinot-new-executive-chef-sydney-hunter-iii-creates-surprises-in-every-dish/. Courtesy of the Beverly Press. Published on June 7, 2012.